Two major events have framed global media policies since World War II: the New World Information and Communication Order (NWICO) in the 1970s–80s and the World Summit on the Information Society (WSIS) in 2003–05. Yet they are rarely studied in their continuity/discontinuity and the intermediary period between the two phases is often ignored although it is a crucial factor in the debate over information flows and their international geopolitics. The World Summit on the Information Society (WSIS) is the first event of its kind within the United Nations to deal with the issue of information in the digital era. This book attempts to fill a gap in the current bibliography as it spans two historical periods that are usually treated separately: the New World Information and Communication Order (NWICO) on the one hand, and the World Summit on the Information Society (WSIS) on the other. To encompass the two events, and assess the continuities and discontinuities between them, the analytical framework is diachronic, with the definition of three main phases. Their distinctive issues are developed in the three sections of the book: 1. The first phase (1970–80) deals with NWICO, especially in relation to information as news, related to the press and with few powerful actors at the global level. 2. 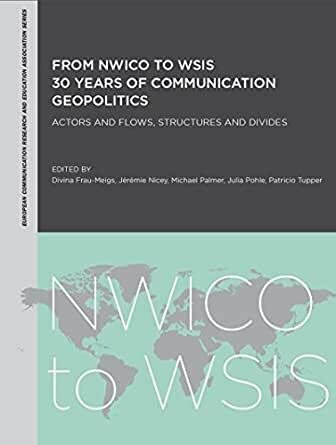 The second phase (1980–2000) deals with the period where the NWICO outcomes are diluted while another view of information as data, related to the rise of information and communication technologies (ICTs), emerges in the political discourse. 3. The third phase (2000–) deals with WSIS both as a legacy of NWICO and as a proposal of a new global governance of media as a process rather than a structure within a single institution. Divina Frau-Meigs is professor of media sociology and American studies at the Sorbonne, whereMichael Palmer is professor in the Faculty of Communication and Information Sciences.Jérémie Nicey is associate professor in the School of Journalism at the University of Tours.Michael Palmer is professor. Julia Pohle is a PhD student in international communication at VU Brussels.Patricio Tupper is professor of media and communication sciences at the University of Paris 8.